Ask Priyabrata Kanjilal, a grocery store owner in one of the bylanes of south Kolkata, for a Vim washing bar. Chances are he will produce an egg (dim in Bengali), for he cannot distinguish between the two words. Twenty years at the store has taken a toll on his hearing ability. During his eight hours at the store it’s not the good old radio that he listens to, but the steady groan of traffic on the 4.5-metre alley. Impatient honks and noise of trucks, buses, autorickshaws, cars and bikes are a constant. The 50-year-old is also a captive listener of the many religious, social and political processions that often pass through the road, all expressing their emotions through blaring loudspeakers. At home his family complains he talks too loudly and turns volume of the television too high. He gets angry easily, suffers from sleep disturbance, recurring headaches and occasional vertigo. A bed of grass, trampled by a morning walker, straightens up in a while. But after a few days of regular walking, it withers and dies. Loud sound or noise does something similar to the ear. Death of a hair cell is permanent. When too many of them die, one would require a hearing aid. Sound travels in mechanical vibrations through the external auditory canal and reaches cochlea, the auditory portion of inner ear. Each cochlea has 18,000 hair cells, so small that all of them can fit on a pinhead. It is the job of these extremely delicate and sensitive hair cells to transform the mechanical energy of the vibrating sound waves to a nervous impulse which, in turn, is processed by the human brain. Thus we hear—the rustling of leaves, whispers, cries and conversations, the rhythmic beats inside a night club, or the painful orchestra of a hundred honks on a choked highway. On the insistence of Down To Earth, Kanjilal underwent a pure tone audiometry. This simple test is done in a sound-proof room where the patient is made to hear sounds of different frequencies. The audiologist increases the sound until it becomes audible to the patient. A normal human being can hear a 4,000-hertz tone at 20 decibels. Kanjilal could hear it at 50 and 55 decibels in his right and left ears respectively. His hearing loss is more pronounced at higher frequencies, suggesting a case of noise-induced hearing loss (NIHL). It is scientifically taken that NIHL affects higher frequencies first. Kanjilal’s loss is irreversible. Continuous exposure to noise will gently kill all the tiny hair cells inside his cochlea, the auditory portion of the inner ear (see ‘How noise impacts hearing’ on p30). “Avoid noise,” recommends his medical report. But he cannot stop going to his shop. “As a society, our tolerance to noise is phenomenal. We seldom mind loud music, honk indiscriminately, and while working in heavy industries rarely ask our employers to give us protective devices,” says Somnath Mukherjee, audiologist at Apollo Hospital in Kolkata. This, despite Kolkata being the first city in India to legislate on noise. Taking up noise as a subject that needs to be urgently addressed, Calcutta High Court judge Bhagabati Prosad Banerjee has passed some pioneering judgements. These were also inspired by the writings of Narayan Ganguly, a Bengali author. In November 1970, the ailing author wrote in his satirical column, Sunondo’s Journal, for a literary magazine: “Even today, there was no respite from the demonic duet of loud music and firecrackers. Perhaps I still have a few days left to eat and breathe, so I haven’t had a heart attack yet…. Heard there is some law regarding amplifiers, but that must be a rumour.” The column, published after Ganguly’s death, left a deep impression on Justice Banerjee. “I started reading on noise pollution after his death—the legal and regulatory history around the world. And then I actually waited for a case,” he says with a smile. In 1996, Om Birangana Religious Society filed a petition in the Calcutta High Court complaining the police was stopping it from using microphones to play religious songs. A few months later, Justice Banerjee pronounced a landmark judgement. “Freedom of speech and expression includes, by necessary implication, freedom not to listen and/or to remain silent… One cannot exercise his right at the cost of and in total deprivation of others’ rights,” he ordered. For the first time in India use of microphones was banned during night hours—from 9 pm to 7 am. “During my tenure, I disposed of noise-related cases regarding violation of court orders every Friday. I also directed the police and the West Bengal Pollution Control Board (WBPCB) to register the complaints anonymously. This encouraged people to lodge complaints,” Justice Banerjee says. His orders helped Kolkata become a better monitored place. The city has improved. WBPCB data shows a drop of about 10 decibels from 1994 to 2009. But it is not enough when the noise level is compared to the ambient noise standards. The impact of rise in noise level is visible countrywide. According to a 2007 world health organization (WHO) estimate, almost six per cent people in India suffer from hearing loss. This, when hearing loss is not monitored regularly in the country. A human ear can detect the rustle of leaves at 10 decibels, hear a conversation at 60 decibels and even sustain the constant rhythmic thudding noise inside a night club at 110 decibels. Sound becomes painful as it reaches 120 decibels. Chronic exposure to sound beyond 85 decibels for eight hours can cause irreversible hearing loss. A 140-decibel sound impulse next to the ear can tear the eardrum. 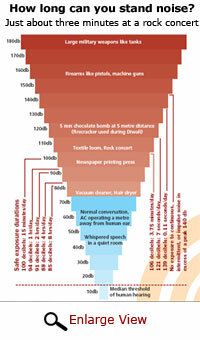 Every increase of 10 decibels makes the sound twice as loud to the human ear. For every three decibel increase in sound after 85 decibels, the safe exposure time gets reduced by half. For instance, if 85 decibels is safe for eight hours, 88 decibels will be safe only for four hours. About 120 decibels sound is safe only for seven seconds. Wondering how then disc jockeys survive? Well, they wear ear plugs as precaution. Imagine listening to your neighbour chatter at 60 decibels without a break from 6 am to 10 pm. It is certainly not very pleasing. That’s the least level of noise a city in India has to bear. 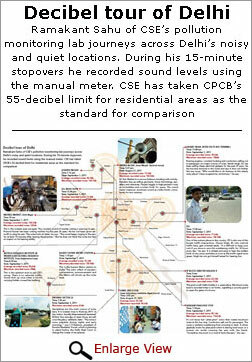 Recent records of the Central Pollution Control Board (CPCB) show Delhi’s busy traffic intersection at the Income Tax Office (ITO) is a loud 73 decibels for at least 16 hours a day. At Acworth Hospital in Mumbai, the average noise level is 69 decibels, a good 19 decibels higher than what is allowed in a silence zone. At 67 decibels, Vashi Hospital in Mumbai is no better. A look at maximum noise levels in 35 places across India comes as a rude reality check. Thirteen stations exceed 90 decibels. 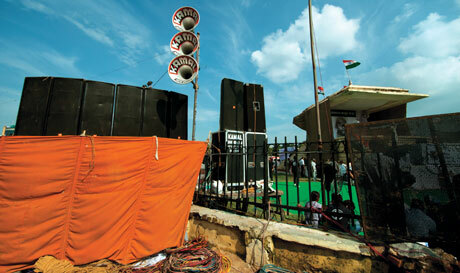 Guindy, a commercial area in southern Chennai, is the noisiest at 107 decibels, literally a rock concert on the streets. The safe exposure limit for this level of noise, according to WHO, is four minutes and 15 seconds. CPCB’S Noise Pollution (Regulation and Control) Rules, 2000, divide areas into four zones—industrial, commercial, residental and silence. Industrial zones are allowed 75 decibels noise during daytime and 70 decibels during the night. Commercial zones can be 65 decibels loud during days and 55 decibels at night. Residential zones cannot exceed noise limit of 55 decibels during the day and 45 decibels during night hours. Similarly sound level at silence zones must not be more than 50 decibels during the day and 40 decibels during night. Cities become noisier during festivals. In 2010, the Mumbai Pollution Control Board (MPCB) recorded 111 decibels in the city during Ganesh Chaturthi. In response to a petition filed by Mahesh Bedekar, a doctor, the Bombay High Court asked the authorities to reduce noise levels, especially around silence zones, during the festival. When Awaaz Foundation, a non-profit working on Mumbai’s noise pollution, recorded noise levels at 13 locations in Navi Mumbai during the festival, it found the pollution level had reduced only in silence zones. Guindy is a crowded commercial and industrial area. It has a busy railway station, corporate offices and a national highway cutting right across. Work on Chennai Metro is on in full swing. This has narrowed down road space, making it chaotic. Guindy connects Chennai to the airport. This further increases road traffic. “Huge buildings and flyovers have trapped noise on the main road. That is why noise behind the buildings is low,” says K Kalaiselvi, a doctoral student working on noise pollution at the civil engineering department of Indian Institute of Technology-Madras. Tamil Nadu Pollution Control Board (TNPCB) is uneasy about the noise level in Guindy. “Other areas in the city or the country could be worse,” says P V Marimuthu, deputy director (labs), at TNPCB. “Since the noise meter is installed on the main road it picks up only traffic noise. We need more meters at different areas in the city to reach a conclusion,” he adds. A Ramachandraiah, professor at IIT-Madras is mapping noise levels in Chennai to assess its impact on environment, taking into account traffic volume, population density and road area of a particular place. The IIT professor has studied the impact of three flyovers on noise levels—Gemini flyover on Mount Road, Adyar flyover near Malar Fortis Hospital and the T Nagar flyover in the busy commercial area. The first two, located in considerably open spaces, have reduced noise level in the immediate vicinity. But the T Nagar flyover, built on a narrow road with buildings on its sides, has pushed the level up like in Guindy. Ramachandraiah aims to predict noise levels vis-à-vis variations in speed and volume of traffic. This would help in identifying roads that can be made one-way and plan flyovers. India does not have enough data on noise. Since 1993, CPCB has been using the manual sound meter. This painstaking monitoring is prone to errors. In April 2010, the authority launched an ambitious Real Time Ambient Noise Monitoring Network. This unmanned system gives fast and accurate readings. The initial stage of this three-phase project covers seven cities—Delhi, Mumbai, Kolkata, Chennai, Hyderabad, Bengaluru and Lucknow. Each city has five terminals in different noise zones. Run on solar power, the terminals capture noise at various frequencies through highly sensitive microphones. A signal processing unit attached to the microphone sends data to the data-logger. The two devices are placed inside a weather-resistant noise monitoring box. This data is transmitted to the monitoring station at the CPCB office in New Delhi through a GPRS modem every second. Information from all terminals is made public on the board’s website. An SMS alerts the monitoring station as soon as noise level at a terminal crosses the threshold. “Continuous data record helps identify noise level violations and take prompt action,” says D D Basu, scientist at CPCB. The environment ministry has spent Rs 460 lakh for the first phase. But work in the second phase, from April 2011 to March 2012, is stuck. The ministry has not released Rs 430 lakh earmarked to install 35 more terminals in the same seven cities. A K Sinha, scientist at CPCB, says the delay may slow down the last phase (from April 2012 to March 2013) in which 18 more states would get five stations each. The aim is to install a total of 160 terminals across the country. “If it comes through, the network will be the largest in the world,” says Sinha. 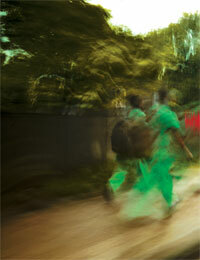 Thirty-five-year-old Rajib Das storms into an audiologist’s clinic with an irritating ringing in the ears. It is a clear case of tinnitus, declares Abhishek Dutta, his audiologist who runs Bengal Speech and Hearing Clinic in Kolkata. This is the result of constantly listening to 100 decibels of noise at the welding factory where Das works. Sudip Saha, 27, is a sales and customer relations officer at Dutta’s clinic. His job demands him to be on phone for at least five hours a day while also scurrying around noisy streets. His audiometry showed his hearing loss was akin to that of a 65-year-old. The two are not isolated cases of noise-induced hearing loss (NIHL). “At least 50 patients come to me with tinnitus and vertigo every month,” says Dulal Bose, ENT specialist in Kolkata. “At least five cases are of sudden deafness, medically known as sensory-neural hearing loss.” Sudden deafness can be noise induced due to explosive sound impacts or due to trauma, accident, viral infection. Autistic children react badly to loud noise. Some hear sound louder than it actually is. “It affects their behaviour,” says Usha Ramakrishnan, chairperson of Vidya Sagar, a voluntary organisation working with children who have neurological disabilities. They react by humming, rocking back and forth and throwing a tantrum. “We give them sensory integration therapy. Their diet is improved and the caffeine and gluten content is reduced,” she says. A 2011 World Health Organization (WHO) report ranks sleep disturbance and annoyance as major components of health burden due to noise. Other impacts are heart diseases and cognitive impairment in children. Studies conducted in the US show 12.5 per cent of the population between six and 19 years has elevated hearing thresholds. About 10 million suffer from permanent hearing loss. “Noise can cause depression or anger people to the extent of violence such as road rage,” says S Manoharan, audiologist at Madras Audiology and Speech Therapy Centre in Chennai. In Western Europe, WHO studied the environmental burden of noise through disability adjusted life years (DALYs). It indicates the sum of potential years of life lost due to ill health, disability or death. The result showed one million healthy life years are lost every year due to traffic-related noise. It also showed that 1.8 per cent of those studied had myocardial infarction, a kind of heart ailment. Twenty per cent children exposed to sound levels between 55 and 65 decibels for 16 hours had developed cognitive impairment. 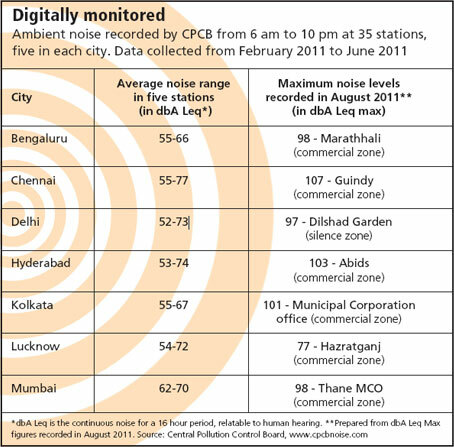 The CPCB data reflects noise levels in this range in Indian cities. In fact, it is higher in metropolitan cities like Mumbai and Chennai. Researchers at the department of civil engineering at Malaviya National Institute of Technology in Jaipur recently studied the impact of noise on people living near roads with heavy traffic. Of those studied, 52 per cent suffered from frequent irritation, 46 per cent were hypertensive and 48.6 per cent suffered sleep disturbance. There is absence of data on the levels of hearing loss in the country. But doctors vouch for an increasing number of of such cases. Many are those whose low hearing acuity is because of medical problems like diabetes. Studies show diabetics are more prone to hearing loss due to NIHL. Workers of an automobile manufacturing company were examined by researchers at Hallym University in Korea in 2005 and 2009. Results showed hearing thresholds of diabetics had significantly increased in 2009. NIHL is also aggravated by air pollution. Researchers found hearing loss more pronounced in mice exposed to cigarette smoke and noise than those exposed to just noise. “People do not take change in hearing patterns seriously. Awareness is very low,” says Suneela Garg, assistant director, community medicine at Maulana Azad Medical College in Delhi. For instance, mill workers subjected to eight hours of machine noise every day are complacent about the noise around them. “Workers were given ear muffs but they refused to wear them,” says Kameswaran, a retired Madras Medical College professor who has studied mill workers’ hearing acuity. “I suspect they found it irksome to remove the muffs each time they had to talk,” he says. Some companies have made basic hearing check-ups mandatory for workers. Without the audiologist’s nod, a worker cannot return to his noisy job in the engine room, says Manoharan. “In case of hearing loss, a patient is moved to another job with less noise,” he adds. Dutta, the audiologist at Kolkata, says he receives about 5,000 corporate workers every year for hearing tests. “But there has been no request for a hearing conservation programme from any of my clients,” he says. “Prevention is not only better but easier than cure: the good-old cliché holds true for NIHL because it is irreversible,” says Somnath Mukherjee, audiologist at Apollo Gleneagles Hospital in Kolkata. It can be prevented by improving one’s diet. Dietary supplements rich in antioxidants can protect hair cells in the inner ear. Food rich in Beta-Carotene, Vitamins C and E, and magnesium protect from threshold shifts. Use of ear plugs and muffs is a sound protective measure. They cost between Rs 20 and Rs 500. Hearing aids are prescribed to those who have mild to moderate hearing loss—unable to hear sound below 70 decibels. A digital hearing aid costs at least Rs 7,000. A sophisticated hearing aid which adjusts to different noise situations, say from a night club to a quiet room, and has blue tooth connectivity, costs between Rs 60,000 and Rs 1,50,000. Hearing aid is of no use to a person with severe to profound hearing loss—unable to hear sound below 95 decibels. Such a person can undergo cochlear implant. 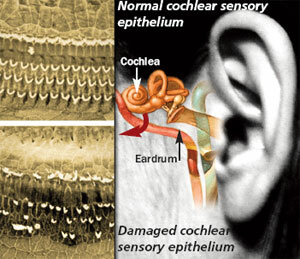 It restores hearing when deafness is due to loss of sensory hair cells in the inner ear. The operation costs at least Rs 7 lakh. “For sudden deafness, steroids like Cortisone are prescribed. But the recovery rate is only 30 per cent,” says Dulal Bose. Fifty per cent of NIHL is preventive. The health ministry, therefore, launched the pilot phase of National Programme on Prevention and Control of Deafness in 2007. The programme focuses on capacity building and training doctors at public and community health centres, anganwadi workers, Accredited Social Health Activists and teachers. The programme covers 176 districts in 11 states. Under the 12th Five-Year Plan it will cover the entire country. It also aims to retain audiologists in the country by giving them better career opportunities. “But its progress is not uniform at present. It is not high on our priority,” says a ministry official. Four years after the Calcutta High Court said that freedom to express also implied freedom not to hear noise, in 2000 the Union environment ministry formulated the Noise Pollution (Regulation and Control) Rules under the Environment Protection Act. It set ambient standards in different noise zones at different times. “The regulations lack teeth,” says Justice Bhagabati Prosad Banerjee who had passed the order. “They have loopholes at the enforcement level. There is no provision of spot fines and confiscation of instruments which are effective,” he adds. There are provisions to punish offenders under the Indian Penal Code, Factories Act, Motor Vehicles Act, Law of Torts, Air (Prevention and Control of Pollution) Act and the Environment (Protection) Act. But they are rarely caught. Horns and engines are major contributors to noise pollution. They shoot up the decibel level of busy traffic. “In Kolkata, unnecessary honking is common even in silence and residential zones,” says Banani Kakkar of the non-profit PUBLIC based in Kolkata. “Since drivers do not observe rules, there is an overwhelming uncertainty about what the next car may do,” she adds. That is when honking begins. Do you hit the remote to turn down the volume as soon as your favourite TV programme takes a commercial break? Few do, but the fact is that advertisements are much louder than the programmes. In the US, the Senate passed Commercial Advertisement Loudness Mitigation Act in September 2010, which requires commercials to be played at the same volume as the programme they accompany. Similar controls exist in Britain which introduced it in 2008. India does not have any broadcasting regulator at present unlike the Federal Communications Commission in the US. The Information and Broadcasting Ministry’s “programme and advertising codes” for private TV channels say “audible matter of advertisement shall not be excessively loud”. 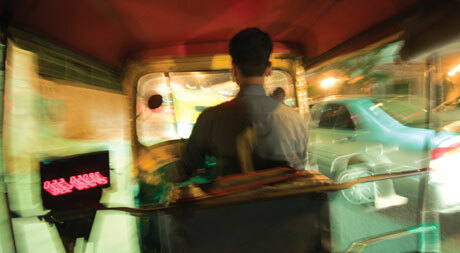 Many autorickshaw and motorbike drivers use shrill hooters. Indian Standards: 1884-1993 sets 125 as the maximum decibel limit for horns used in commercial vehicles; 105 db is the maximum limit for horns of two-wheelers. Its violation can lead to seizure of the driver’s licence. Loud air-pressure horns that vehicles like trucks and buses use invite fine of Rs 100 under the Motors Vehicles Act. But how many times are these provisions invoked? “It is difficult to catch each offender,” says T Paldan, additional commissioner of Delhi Traffic Police. “How does one identify who has been honking incessantly on a busy road? We try our best but our priority is to ensure smooth traffic flow,” he adds. While noise from horns can be controlled at the manufacturing level, the brunt is usually borne by consumers. In Mumbai 1,907 people were penalised for using pressure horns, musical horns and noisy silencers in 2007. The number was 3,513 in the first six months of 2008. “Automobile manufacturers adhere to the Central Pollution Control Board (CPCB) norms,” says K K Gandhi, executive director (technical), Society of Indian Automobile Manufactures in Delhi. As per the Environment (Protection) Amendment Rules, any road vehicle must not be noisier than 85 decibels. Motorcycles, scooters and three-wheelers can be 75-80 decibels loud while cars are allowed up to 75 decibels. “We ensure that a vehicle does not create unwanted noise, vibrations and harshness (NVH). But once the vehicle is on the road, it is not our responsibility to check its noise level,” he says. Salim, auto mechanic at Shahin Bagh in Delhi, says, “People get mesh of their motorbikes’ silencer removed so that it gives a booming rythmic sound, a distinct feature of Bullet and Yamaha bikes. When one starts such a bike the sound can be heard inside a fifth-floor house.” There is no regulation on driving with a tampered silencer. A vehicle’s noise can be reduced by strengthening its joints, insulating its engine by acoustic covers and using padded hood liners. Japan has launched cars with the noise-cancelling technology. The system comprises microphones to monitor sound which transmit the exact opposite of these frequencies, thus cancelling ambient noise. Car manufacturers do not reveal NVH values of their vehicles. Independent reviewers say each brand varies because of its design. NVH of Maruti Omni, for instance, is high because its engine is under the front seat. Government’s involvement in minimising noise exposure level has been minimal. Worse, it has increased it. Without the mandatory public hearing, it cleared expansion of the Indira Gandhi International Airport. Runway 29/11 was built 2.8 km from Vasant Kunj, a residential area in Delhi. The airport also affects residents of Pushpanjali Enclave, Samalka and Dwarka. On September 25, 2009, the day the plush runway became operational, 55-year-old Anil Sood of Vasant Kunj, began his morning tea with the booming sound of three huge aircraft that flew past one after another. A little distance away, patients at the Indian Spinal Injuries Hospital (ISIH) were jolted out of their sleep. Residents of the affected localities requested the Delhi International Airport Limited (DIAL) and Director General of Civil Aviation (DGCA) to change the routes of flight away from residential and silence zones. When nothing happened, Vasant Kunj Residents’ Welfare Association and ISIH authorities filed a petition in the Delhi High Court. The ongoing case will be heard next on September 21. “DIAL and the environment ministry kept us in the dark,” says Sood, who is president of a Delhi-based non-profit Chetna. DIAL had stated that noise level at airport boundary will be 60 decibels and 55 decibels beyond the airport. This was not complied with, he says. The petition says the affected area suffers 70 decibels, peaking at 103 decibels. The petitioners have asked for imposition of night curfew. As many as 213 international airports have night curfew. A working group under DGCA had recommended landings and take-offs only between 6 am and 10 am. Records for this year show 56 per cent of the flights that arrive at IGI Airport between 10 pm and 6 am are domestic. “These are not long-distance international flights affected by time zones. They can be asked to land before 10 pm,” fumes Sood. There is little awareness on high exposure to noise and its health impact. The regulations need to be strengthened and loopholes plugged. “The existing norms will be revised once CPCB gets enough real time monitoring data,” says A K Sinha, scientist at CPCB. But it is for the environment ministry to ensure that the new noise limits are imposed diligently. I regularly read Down To Earth. Thank you for this immensely educative article. The problem is: No ministry or public authority is looking at proactively reducing noise levels by putting up sound barriers around highways, railway lines etc. I live in Mumbai, Borivli, in a relatively quiet neighbourhood near the Western Express Highway. A number of high-rise apartment blocks have been built alongside this extremely noisy highway, and all the flats facing the highway -- right upto the 30th or 40th floor, are constantly bombarded with a steady roar of traffic noise. We recently considered buying a house on the 18th floor, but we didn't, because I couldn't stand the steady bass noise, even at a distance of over a kilometre from the highway as the crow flies. And this noise was very disturbing, even through two layers of glass. I have experienced that Bass noise travels through the entire structure as vibrations, and is conveyed to us even through the seats on which we sit and the beds on which we sleep. I shudder at the thought of my family living in such conditions 24x7. It would be extremely disturbing mentally, and exhausting physically. But I am continually amazed to see large numbers of educated and seemingly intelligent families buying such houses and paying over1.2 crores for them. Apart from hearing loss, it must be causing psychiatric disorders and aggravating pre-existing medical conditions such as heart disease! I live in Himachal Pradesh. I live in Himachal Pradesh. we call our state Devbhumi. Here one can find temples in plenty and on every temple top one can notice a loudspeaker meant to torture people by playing 2nd grade Bhajans at full pitch witout caring for the ones who lives nearby. During navratras(The 9 holy days) the season of Jagrans continue for 9 days and all the laws are flouted. Cheap singers keep on chanting the Bhajans based on famous filmi songs at full pitch and no body dares to stop them not even the police who may be present in the pandal for keeping law and order. If someone objects to this violation of law he/she is treated as a traitor. but to stop this menace one must be ready to be a taitor even. Thanks for such an eye opener article and hope the people will now understand the menace called noise pollution. 15 years of living in Bangalore I suspect I have mild hearing loss. While travelling by public transport, women are seated in the front of the bus - close to the noisy engine and horn. I wonder if this layout aggravated it. I have now moved to a rural area - but even here the sound of internal combustion engines is ubiquitous - brush cutters, tipper trucks, and tourists - who come to enjoy the quiet countryside but insist on playing their favourite music loudly in their vehicles. The weekends are the noisiest. Excelent article indeed. SOUND CURFEW during night hours is VERY NECESSARY and that is possible only when laws are enacted properly. How many of us know that there can not be loudspeaker in open places (even in lowest volume) between 10 p.m. and 6 a.m? How many people know that you can't blow even the Scooter horn during the night hours? How many police officers in India have imposed IPC 268, 290 and 291 apart from the Environment Protection Act-1986 against Noise Pollution.